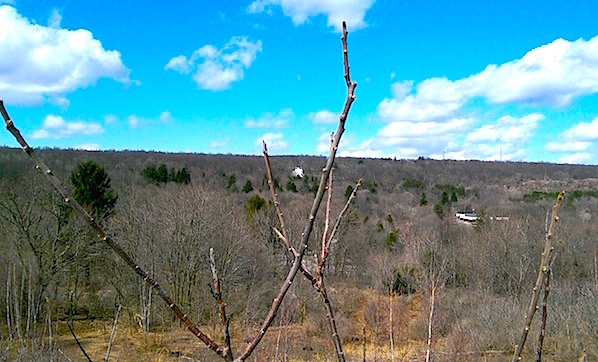 Sawney Hatton » Centralia: The Black Diamond of Columbia County! There are no welcome signs (excepting the town line markers) greeting visitors today to Centralia, PA, but there needn’t be any. Upon entering the historic coal mining borough, you can’t help feeling like you’ve stepped back into a bygone era, one that received all folks with a winsome smile, a fresh glass of sun tea, and one of those little American flags on a stick. Everywhere you look you see signs of what once was and what in many ways still is. It’s a place evoking a simpler time, the classic “small town” character that, by stubbornly clinging to its homespun roots, refuses to go extinct. Indeed, many claim Centralia is on the brink of death, its slide to becoming a modern-day ghost town begun when its once-booming anthracite industry shut down in the 1960s. Yet adventurous visitors of all ages are treated to an abundance of hobbyist opportunities and captivating attractions there. Nestled in the wooded hills of the Appalachian Mountains, Centralia (est. 1866) is centrally located in Columbia County, accessible via PA Route 61 where it intersects with Route 42. When I arrived there that sunshiny day, I didn’t even realize I was in the town, or any town. I must have driven through it three or four times before I found my bearings. The first point of interest I visited—primarily because it’s the highest point of interest in the town, hence the easiest to spot—was the Assumption of the Blessed Virgin Mary Church. 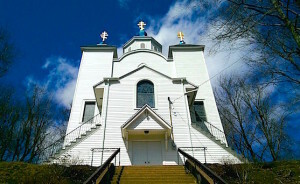 Still operating after more than a century, the Ukrainian Greek-Catholic house of worship is a towering white edifice topped with three Byzantine crosses set on azure blue domes. The interior features an ornate, early 20th century, Italian-painted Iconostasis, gilded almost to excess, that will surely take your breath away. The grizzled groundskeeper I spoke with said it was like “somethin’ from a Roman art museum.” I couldn’t agree more. 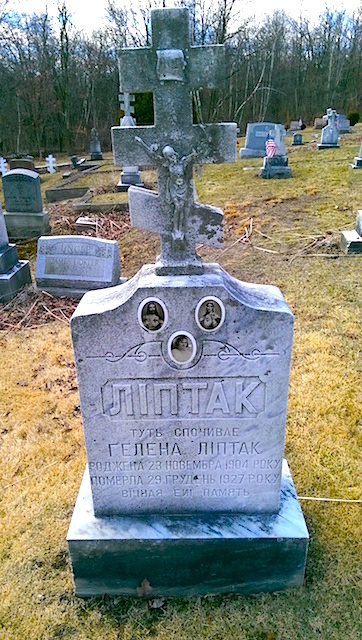 A short amble behind the church led me to its well-maintained cemetery, one of four in Centralia. The grounds exhibit magnificent sculpted tombstones, some dating as far back as the 1920s, with others far more recent. One cannot miss the irony: in a town whose population has dwindled dramatically (from more than 1,400 residents in 1960 to just 10 as of the 2010 U.S. Census), Centralia’s graveyards remain its lone parts that are still growing. I pondered this while reclined on the final resting place of Helena Liptak (b. 1904 – d. 1927), smoking the Drew Estates Java cigar I had purchased from a Cigars International superstore (1635 Mountain Rd, Hamburg, PA) on the way there. I haven’t felt so peaceful in ages! Next I explored random streets throughout the town. Even with Google Maps I was still quite lost, as most of Centralia’s roads no longer have their names posted. The majority of the homes once lining these streets had been leveled after they were vacated, replaced over the years by lush green flora. I imagine the land now makes for ideal camping areas, and I spied a few hiking trails heading deep into the verdure. Those who enjoy restoring old furniture may find a treasure trove of household décor discarded on the roadsides, or even an animal skull to add an outdoorsy touch to their den or office. There’s ample parking everywhere. The hotbed of activity in Centralia centers around St. Ignatius Cemetery (which I had passed twice, mistakenly thinking the cars parked on the street in front belonged to mourners). The area serves as a prime location for offroad ATV and motorbike riding, offering many fun hilly trails for recreational motorists. Walking up the slope to the right of the cemetery, I was treated to spectacular tree- and windmill-lined vistas of the town, great for photographers of all stripes. I asked one high school student and plucky shutterbug, Courtney, what she thought most striking about Centralia. “It’s awesome,” she answered. “There are so many great pictures to take here!” If you’re fortunate, you can snap a shot of one of the scattered plumes of smoke occasionally billowing from the kindled rock beneath the town. (I was warned not to get too close to them should I encounter any, as they are very hot and unbreathable.) It was too windy to see any such vaporous displays the day I visited, though I could smell the sulfuric tang on the breeze. It reminded me of the cookouts I had as a child with my family and friends at my favorite park on Long Island. 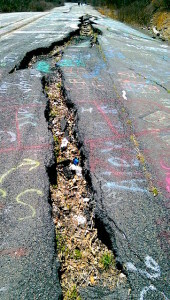 The highlight of my Centralia experience was strolling along the attraction the town is famed for: its Graffiti Highway. Once part of Route 61, the mile-long stretch was permanently closed in 1994 due to severe fracturing. 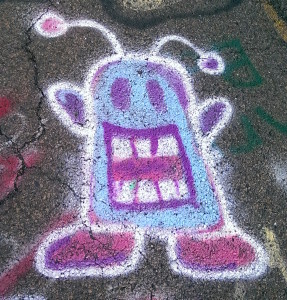 Since then, people have used the paved roadway as an artist’s canvas, spray-painting colorful pop culture homages, words of wisdom, and phantasmagorical designs across the length of it. (I noted skulls and phalluses to be recurring motifs.) It’s a remarkable communal project, showcasing the array of talent the region produces. “There’s a lot of funny, weirdass stuff on here,” said Mike, 22, a resident of nearby Pottsville “just hanging out” that day in Centralia. He pointed to an illustration of a smiling (or screaming) alien creature. “I did this one like two years ago,” Mike declared. Asking him why he had wanted to put his artwork on the road, he answered pithily, “It’s cool.” I contemplated someday returning here with paints to add my own cool image to the repurposed straightaway, perhaps of a clown puffing on a cigar, the tattoo I never had the courage to get. 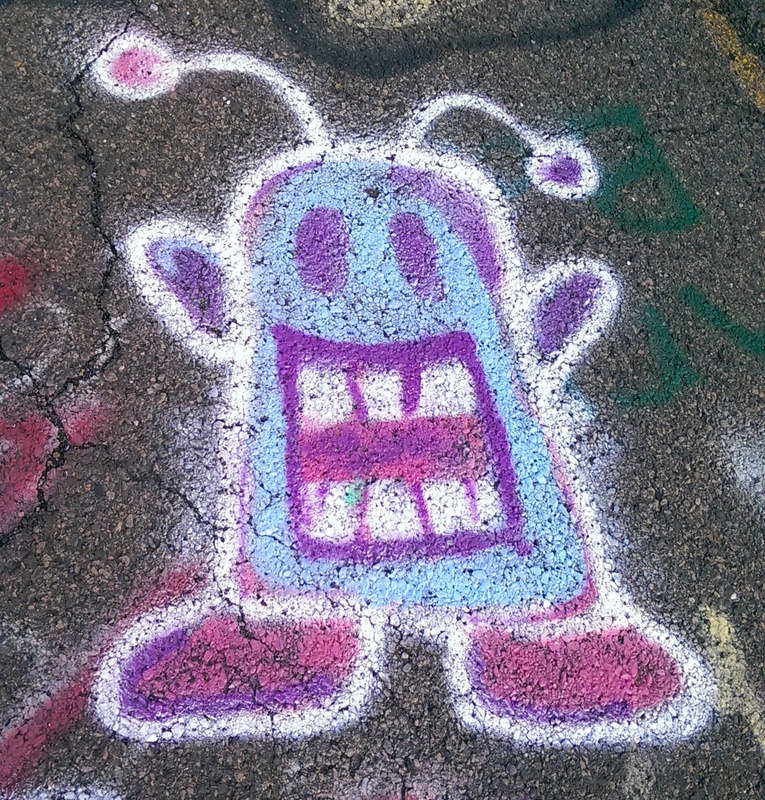 Graffiti Highway is an appealing and equally enduring alternative for it.